Production: Shochiku/Ofuna; color, 35mm; running time: 136 minutes; length: 12,509 feet. Released 3 November 1953, Tokyo. with Itsuo Takahashi; music: Takanobu Saito; costume designer: Taizo Saito. Cast: Chishu Ryu ( Father ); Chieko Higashiyama ( Mother ); So Yamamura ( Koichi ); Haruko Sugimura ( Shige Kaneko ); Setsuko Hara ( Noriko ); Kyoko Kagawa ( Kyoko ); Shiro Osaka ( Keizo ); Eijiro Tono ( Sanpei Numata ); Kuniko Miyake ( Fumiko ); Nobuo Nakamura ( Kurazo Kaneko ); Teruko Nagaoka ( Yone Hattori ); Zen Murase ( Minoru ); Mitsuhiro Mori ( Isamu ); Hisao Toake ( Osamu Hattori ); Toyoko Takahashi ( Shukichi Hirayama's neighbor ); Mutsuko Sakura ( Patron of the Oden restaurant ); Toru Abe ( Railroad employee ); Sachiko Mitani ( Noriko's neighbor ). Ozu, Yasujiro, and Kogo Nada, Tokyo Story , edited by Donald Richie and Eric Klestadt, in Contemporary Japanese Literature , edited by Howard Hibbett, New York, 1977. Richie, Donald, and Joseph Anderson, The Japanese Film: Art and Industry , Rutland, Vermont, 1960; revised edition, Princeton, 1982. Satomi, Jun, Tomo Shimogawara, and Shizo Yamauchi, editors, Ozu—Hito to Shigoto (Ozu—The Man and His Work), Tokyo, 1972. Schrader, Paul, Transcendental Style in Film , Berkeley, 1972, 1988. Burch, Noël, Theory of Film Practice , New York, 1973. Richie, Donald, Ozu , Berkeley, 1974. Schrader, Leonard, and Haruji Nakamura, editors, Masters of Japanese Cinema , New York, 1974. Burch, Noël, To the Distant Observer , Berkeley, 1979. Klinowski, Jacek, and Adam Garbicz, editors, Cinema, The Magic Vehicle: A Guide to Its Achievement: Journey Two , Metuchen, New Jersey, 1979. Sato, Tadao, Currents in Japanese Cinema , Tokyo, 1982. Bordwell, David, Ozu and the Poetics of Cinema , Princeton and London, 1988. Desser, David, editor, Ozu's Tokyo Story , Cambridge, 1997. Miner, Earl, in Quarterly of Film, Radio, and Television (Berkeley), Summer 1956. Anderson, Lindsay, in Sight and Sound (London), Winter 1957–58. Ryu, Chishu, "Yasujiro Ozu," in Sight and Sound (London), Spring 1964. Hatch, Robert, "The Family of Ozu," in Nation (New York), 22 June 1964. Wood, Robin, in Movie (London), Summer 1965. Gow, Gordon, in Films and Filming (London), July 1965. Farber, Manny, "Ozu," in Artforum (New York), June 1970. "Ozu on Ozu," in Cinéma (Paris), Summer 1970. Richie, Donald, "Yasujiro Ozu: A Biographical Filmography," in Film Comment (New York), Spring 1971. Menon, N. S., in Take One (Montreal), May-June 1971. Tessier, Max, "Yasujiro Ozu," in Anthologie du Cinéma (Paris), July-October 1971. Kauffman, Stanley, in New Republic (New York), 18 March 1972. Menon, N. S., in Take One (Montreal), July 1972. "Ozu on Ozu," in Cinéma (Paris), Winter 1972–73. Coleman, Francis X.J., in Favorite Movies: Critics' Choice , edited by Philip Nobile, New York, 1973. Bonnet, J., "A la decouverte d'Ozu," in Cinématographe (Paris), February 1978. Martin, M., in Ecran (Paris), February 1978. Wood, Robin, in Positif (Paris), February 1978.
" Tokyo Story Issue" of Avant-Scène du Cinéma (Paris), 15 March 1978. Gauthier, G., in Image et Son (Paris), April 1978. Richie, Donald, "Yasujiro Ozu," in Cinema, a Critical Dictionary , London, 1980. Konshak, D. J., "Space and Narrative in Tokyo Story ," in Film Criticism (Edinboro, Pennsylvania), Spring 1980. Hosman, H., in Skoop (Amsterdam), September 1980. Shipman, David, in Films and Filming (London), November 1983.
" Tokyo Story Section" of Skrien (Amsterdam), Winter 1983–84. Berta, R., Interview with Yahara Atsuta, in Cahiers du Cinéma (Paris), December 1985. "Ozu, la vita e la geometria dei film," in Castoro Cinema (Florence), no. 151, 1991. Wood, R., "The 'Noriko' Trilogy," in Cineaction (Toronto), Winter 1992. Zunzunegui, S., "El perfume del Zen," in Nosferatu (San Sebastian), vol. 11, January 1993. Modern Review , vol. 1, no. 12, December-January 1993–1994. Berkes, Ildikó, "Tokiói történet," in Filmkultura (Budapest), vol. 30, no. 12, January 1994. Rayns, Tony, in Sight & Sound (London), vol. 4, no. 2, February 1994. Aloff, Mindy, "How American Intellectuals Learned to Love Ozu," in The New York Times , 3 April 1994. Télérama (Paris), no. 2370, 14 June 1995. Nicholas, Gregor, "Slipper Shots," in Sight & Sound (London), vol. 7, no. 8, August 1997. Film historians have long singled out three major directorial talents from Japan: Akira Kurosawa, Kenji Mizoguchi, and Yasujiro Ozu. And, at least in the West, and to almost as great a degree in his own nation, Tokyo Story stands for the best in Ozu's nearly forty-year career, a superior example of a filmmaker at the height of his powers. The narrative of Tokyo Story seems straightforward and simple enough. An elderly couple, living by the sea in Onomichi in the south of Japan, go to visit their grown up children in Tokyo, but find they do not fit in. Their children (and grandchildren) have become mean and selfish, negatively effected by city living. The grandparents are only treated nicely by their widowed daughter-in-law, who despite having to live in poverty, has retained traditional values. The grandparents eventually return home, and the grandmother dies, leaving the grandfather to face the future alone. Tokyo Story hardly has a happy ending. By closing the drama with the daughter-in-law going off, leaving the grandfather by the now familiar port, we confront the often sad reality of everyday existence. Tokyo Story presents an all too common situation, a tale of real life which happens more often than we like to consider. The point is that while the Hollywood system would not permit such a tragic tale to make it to the screen the Japanese industry would. Most critics find Tokyo Story central to Ozu's final period of filmmaking, the last great excursions of a virtuoso in a lengthy career in the Japanese cinema. 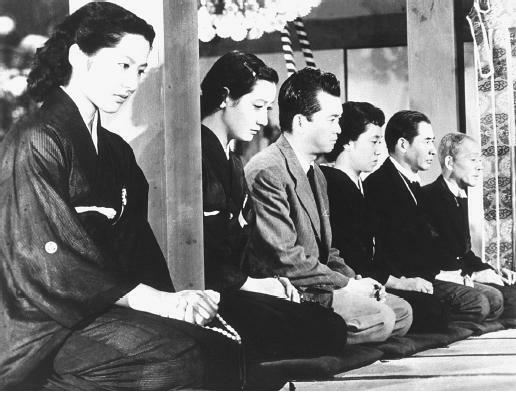 During the 1950s, after Japan had emerged from the war, Ozu often dealt with traditional values. The "Tokyo" in the title was central to the life of the nation after 1880, presenting to the world how Meiji Japan could succeed in western arenas. By the 1920s Tokyo stood as one of the more populous cities in the world. Of Ozu's fifty-four films, some forty-nine take place in Tokyo and five mention the city in their title. This city, more than any, symbolized the modern world, with its mass culture, including the ever growing obsession with motion pictures. In certain respects Tokyo Story is a typical work, but in many it is not. Although not all of Ozu's films are about the family, certainly he was vitally interested in that part of Japanese life. He was, after the war, particularly intrigued with the changes his nation was undergoing. Although Ozu is most often seen as a traditionalist, he was always concerned with the events of everyday life. Tokyo Story is typical of late Ozu in that it arose from immediate concerns of the early 1950s, in particular Tokyo being rebuilt and families becoming more "urbanized." Tokyo Story illustrates the structural rigor and richness of the later Ozu films. This is true for editing, camerawork, mise-en-scène, and sound. For example, three recurring sounds define the acoustic texture of the film: chugging boats, the noises of trains, and the sounds of cicadas. All three are established in the film's initial scene when the grandparents prepare to leave Onomichi. Their stay in Tokyo is then constantly punctuated by train whistles. Later when the grandmother is about to die the scene opens with train sounds and closes with the noises of harbor boats. In the West Ozu is celebrated as an artist. But in the Japanese film industry he was seen as a steady worker. He created, on schedule, one film a year for the massive Shochiku studio. He was that studio's most famous director, and films such as Tokyo Story kept profits flowing in the years before television would become a rival for the mass entertainment audience. And he was honored in industry polls. Tokyo Story won the "Kinema Jumpo" first place for the best film of the year in Japan. Although Tokyo Story was released in Japan in November, 1953, and was a popular success there, it did not make its impact in the West until nearly two decades later upon its release in the United States in 1972. But today critics around the world list it among the greatest films ever to be created in the nearly one hundred years of world cinema.